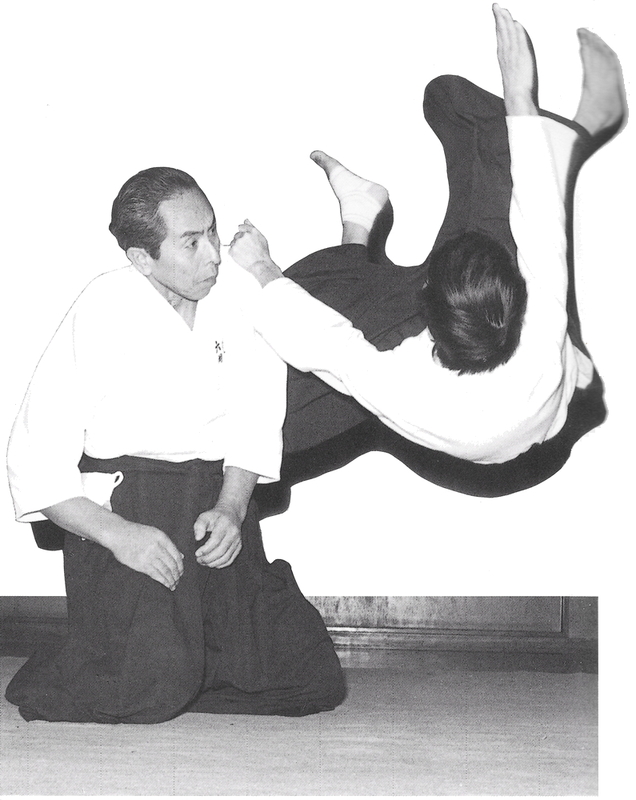 Daito-ryu Aiki-jujutsu Roppokai Founder Seigo Okamoto was born in 1925 in Yubari City, Hokkaido. In 1963, at the age of 38, he entered the dojo of Daito-ryu Aiki-jujutsu Kodokai Founder Kodo Horikawa, one of Sokaku Takeda’s closest students. 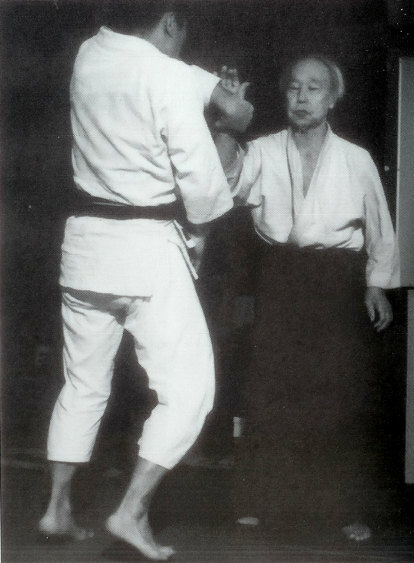 In 1974 he received his 7th dan from Kodo Horikawa, and his Shihan license from Kodo Horikawa four years later in 1978. 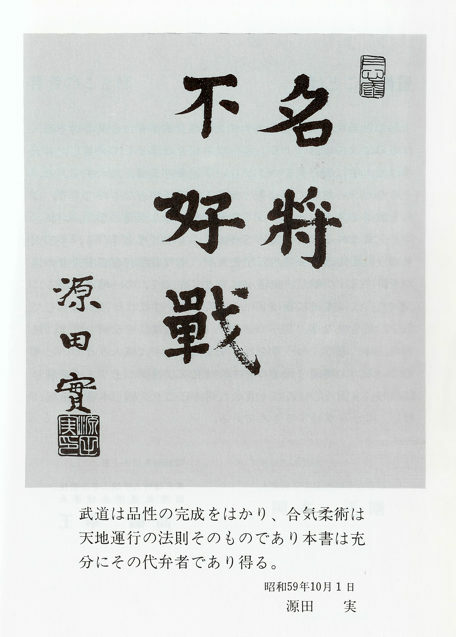 After Horikawa Sensei passed away, he established his own organization, the Daito-ryu Aiki-jujutsu Roppokai, where he became known for teaching advanced techniques to beginning students and for making public many aspects of Aiki that had previously been considered secret. Seigo Okamoto passed away on January 17, 2015, just a few weeks before his 90th birthday. Roppo can be understood in a variety of ways, such as the roppo of roppogumi [six groups of chivalrous young men who used to wander the city streets in the Edo period]. Or it can be equated with the roppo from the kabuki term roppo o fumu of Benkei [a priest of the early Kamakura period and a famous retainer of Yoshitsune Minamoto. Roppo o fumu means to make one’s exit with bold gestures along the runway]. However, I usually compare roppo to gaming dice to describe techniques which can deal with any situation from any direction, top or bottom, front or back, right or left, like the faces of dice. But these techniques do not have square angles like dice but are round, forming six (roku) infinite circles. I am eager to get as many meanings as I can out of the term. 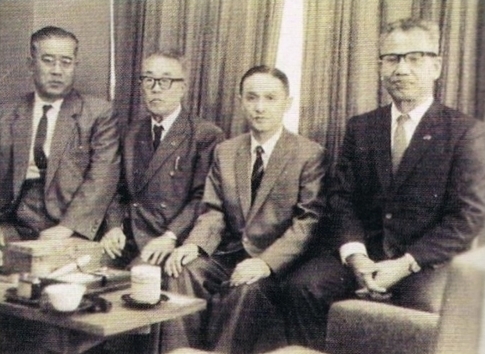 Once, at the beginning of the Taisho era, Takeda Sokaku, while staying for a short while in Tokyo, had an opportunity to go out to the theatre. Sokaku, having set up camp near the hanamichi was observing Kikugoro’s movements. He was [playing] Benkei, at the Ataka Barrier. Making to chase after Yoshitsune’s party after they exited, Kikugoro was stepping along the hanamichi near where Sokaku had set himself. At that moment, Sokaku commented: “the performance is good, but the footwork is bad: the roppo is really bad,” in a voice loud enough that the actor could hear. Kikugoro, not having been able to see from the stage, afterwards sent an attendant out. “Just now, in this vicinity, someone was kind enough to comment?” he enquired. Sokaku having immediately informed him that he was the relevant gentleman, the attendant requested that he go with him, just as he was, to the dressing room. After which Sokaku, having met Kikugoro himself, precisely and infallibly indicated the shape and motivation of the movements. That is: in response to Kikugoro’s questioning, he immediately gave him guidance in the movements of the arms and hands, the movements of the feet. At that time, it is said, Kikugoro hadn’t before played Benkei. Nevertheless he was one of the leading actors of the time. 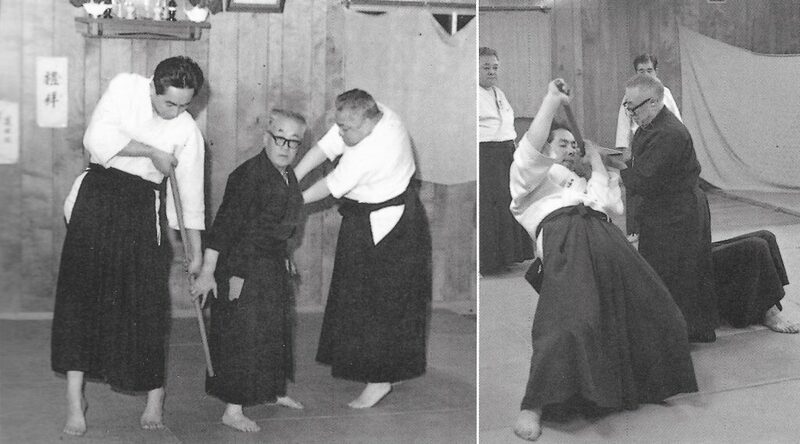 After Sokaku’s guidance, overnight, [everyone] could see that his arm gestures and leg movements were being played in a manner that was completely unrecognizable. It is reported that – starting that very next day – Kikugoro used to receive lavish praise, from his patrons and customers, for the outstanding footwork of his wonderful roppo…. This the first part of an English translation of an interview with Seigo Okamoto that appeared in Hiden Koryu Bujutsu vol 4, 1990, published by Gekkan Hiden (月刊秘伝 / “Secret Teachings Monthly”), a well known martial arts magazine in Japan. Seigo Okamoto Sensei’s instruction currently takes place in Tokyo at the Bunkyo Sports Center. It was here that we first experienced his unique method of instruction. 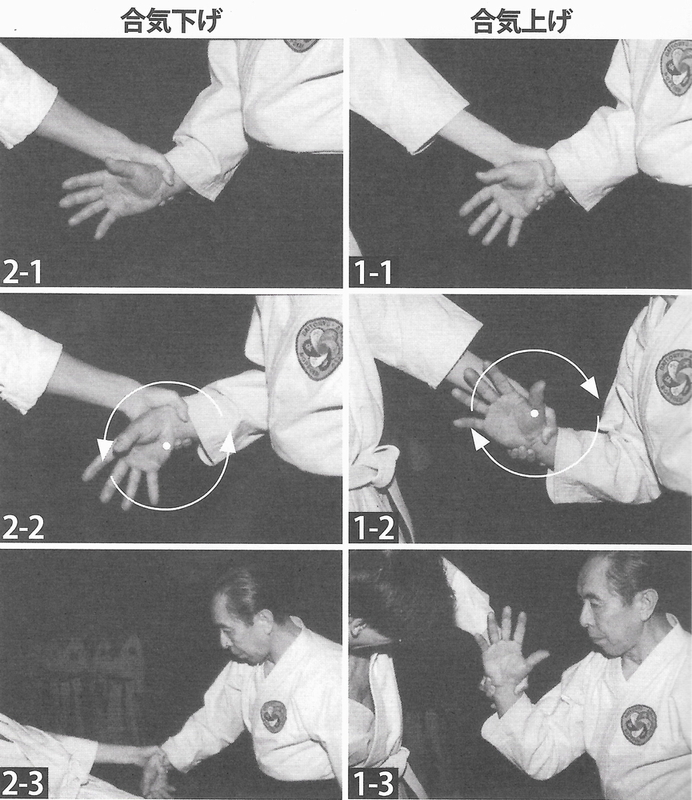 In Okamoto Sensei’s instruction, he uses a method in which when a technique is taught he always applies that technique to each of the students, so that they will be sure to naturally comprehend it through their bodies. Then through kakari-geiko (a line drill with continuous attacks) with each other the students gradually make it their own. The students are divided into three groups, in each group one person acts as the tori, and the rest become uke and take turns attacking the tori. After throwing four or five times the next person takes a turn as tori and the training continues. Okamoto Sensei occasionally gives general advice. That is, giving demonstrations of good and bad examples, showing the technique in slow motion while explaining the principles, things that are extremely concrete and easily understood. However, just because one understands how it is done does not mean that they are able to do it that way right away. Of course, one can see varying levels of ability among the students. Here beginners and those with experience are not divided, everybody learns the same techniques together. We can certainly say that the technical method of Aiki that is unfolding before our eyes is mysterious. 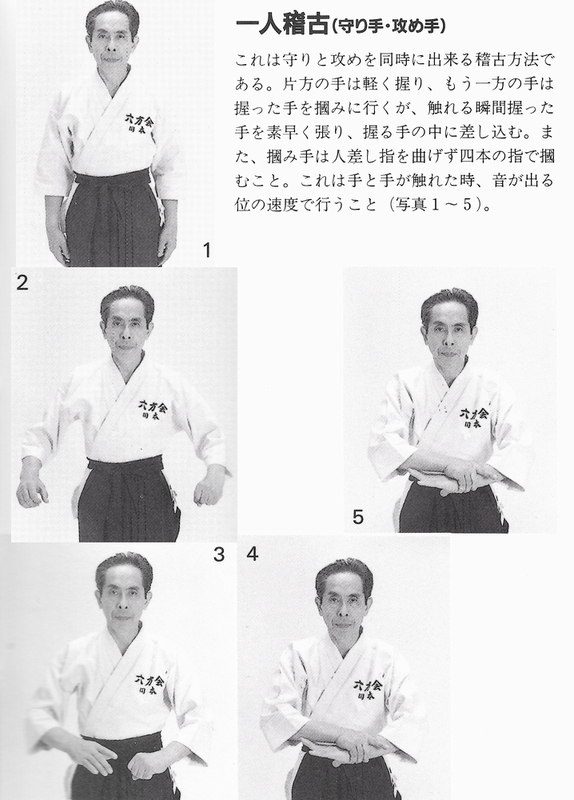 As the students grasp Okamoto Sensei with all of their strength they are blown away with a shake of his body. Even if they grasp Okamoto Sensei’s finger it is the same. 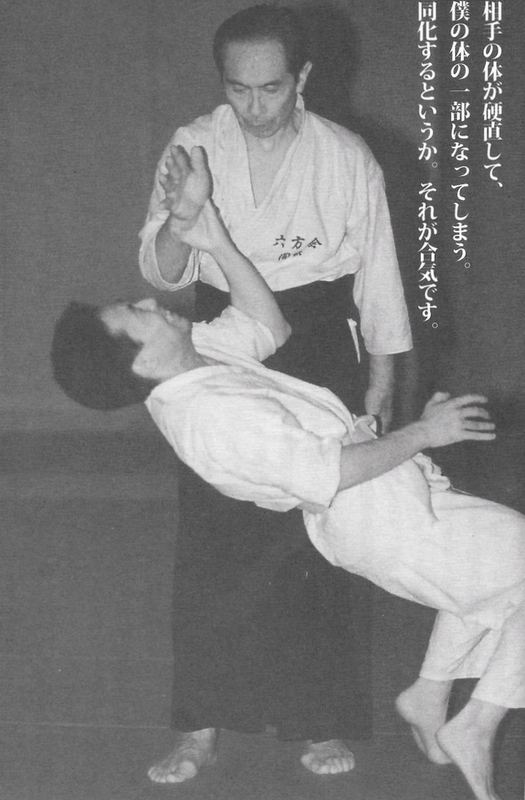 Okamoto Sensei doesn’t grab the student’s bodies, he throws them with the touch of a single finger. Other high level technical methods are also revealed and climax with multiple attackers. Grabbed by five students, they are toppled in an instant. Although they don’t appear to be held down in any significant way the five people are unable to move their bodies. This can be thought of as the application of Aiki, but even so it is an incredible spectacle. Immediately following the training we asked about this mysterious Aiki that has been transmitted from the master Kodo Horikawa Sensei. 2 – How is “Aiki” applied? Q: We’ll jump right in – Okamoto Sensei, just what kind of a thing is your Aiki? Okamoto: The word Aiki itself is difficult, isn’t it? In Aikido or Daito-ryu it varies according to the expressions of the individual instructors, and each of them presents a different image. To me Aiki is conditioned reflex, circular movement and kokyu-ho (“breathing method”) – I express it as these three elements made as small as possible within the space of a moment. 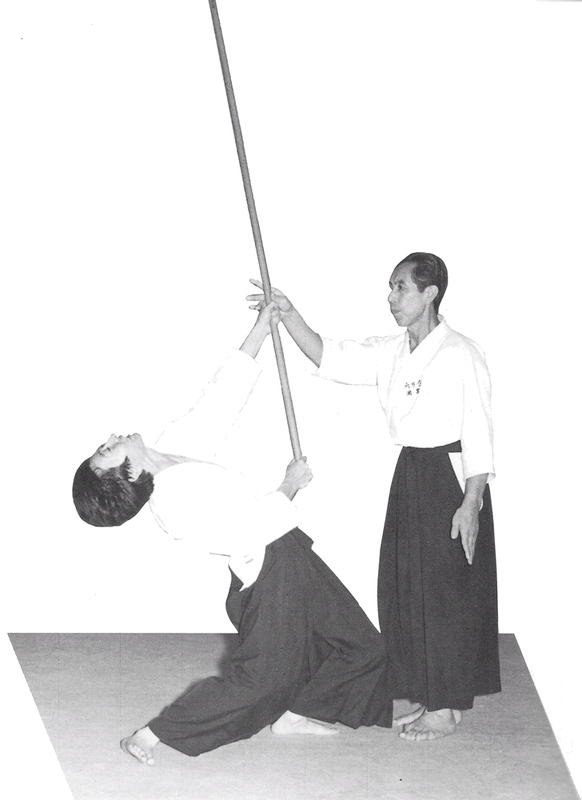 These three elements, applied as subtly and as small as possible in technique are Aiki. As to the techniques themselves, as I have shown you today they take many different forms, but one cannot understand them through the form alone! For example, if one grabs my chest or if one grabs my shoulder, I execute the same movement using those three elements. For that reason, however I am grabbed I throw them down with the same movement. Q: We observed techniques in which their hand was unable to let go as they were pulled along, is it because of Aiki that their hand became stuck to you? Okamoto: That was due to a reflex action by the opponent’s fingers, they become stuck to my hand and are unable to release. If I simply stroke the top of the opponent’s hand it won’t curl, but if I do this with my fingers on the opponent’s hand then the opponent’s fingers curl through a reflex action. If this is done quickly then without a doubt they will curl. For that reason, they become stuck. If one pulls them along this way then they will not separate, but if one becomes slack then they will quickly become separated. That state in which they are pulled along is the state in which one is applying Aiki. 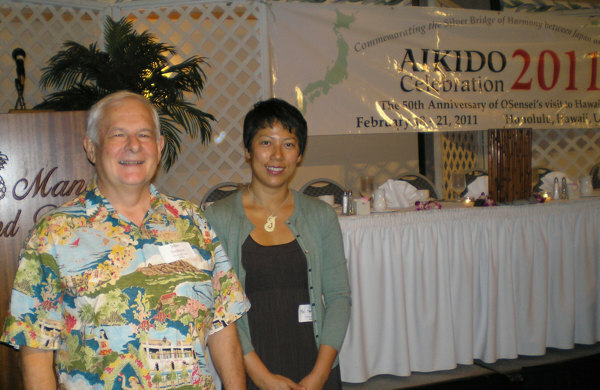 Q: What does it mean to apply Aiki? Okamoto: In a normal state, if one uses strength then the opponent will not move, but if one applies Aiki then they will move. That is a technique of the fingers and such. However, one does not pull them. When they use the thumb and the littlefinger to grasp a wrist the opponent stiffens for a moment, and we continue to hold onto and continue that stiffened condition. Q: Is it through that tiny movement that the opponent moves? Okamoto: Yes, that’s right. One doesn’t need strength. But just doing that won’t work well. In the end technique become necessary. Particularly circular movement, in that one doesn’t move the point that has been grasped and enters while naturally rotating that as the center point. In addition, there is a conditioned reflex when one is touched. When they are touched the opponent always exhibits a reflex. When the opponent stiffens one can connect to the point at which they are touching them and they become one part of my body. It is for that reason that I am able to move them as if I am moving my own body. It’s somewhat clumsy, but one doesn’t need any significant amount of strength. Perhaps it could be called a synchronization – this is what is called Aiki. Q: when Aiki is applied it feels as if electricity passes through your body, would you say that your neck receives a shock? Okamoto: That does happen. Depending upon the person there are those that feel it and those that don’t – if one has ten people then each of those ten people will feel it in a different way. The more sensitive that a person’s reflexes are the easier it is to apply techniques. Q: So there are people on whom it is easier to apply Aiki to, are there also people on whom it is more difficult? Okamoto: Among those coming to train with us are many people with experiences in various Budo such as Judo, Karate, boxing, Ninjutsu, Chinese boxing, Aikido and so forth. I couldn’t say unconditionally, but it’s easy to apply technique to third or fourth dans in Karate. It’s just that their reflexes are conditioned more than a normal person’s and their reactions are quick. That makes it easier for them to react to our techniques. Q: What kind of action is it that causes a shock to be received? Okamoto: This is the so called whiplash. When a car crashes there is a snapping force, that’s what it is. We’re not just pushing on the opponent when they come to attack, we draw them towards ourselves while pushing. While the opponents legs move towards us their body goes towards the back. We initiate that kind of action with our hands. Just pushing on the opponent won’t make them fall down, will it? They’ll just bounce back away from us. But if you step on your opponent’s feet at that time the opponent will fall down without being able to move backwards. It’s the same as that. To do that we apply technique to the opponent in order to stop their feet without stepping on them. If you just push on the opponent then they will escape, but if you pull them for a moment at that time then their legs will come towards you. We halt their step there so that they will not come toward us. There we apply force in the opposite direction. For that reason, through the application of leverage we can move the opponent with a small movement. 3 – Daito-ryu is “Iai”? Q: During that time you are applying a normal physical force? Okamoto: That’s so, of course. However, if we consider each other’s power as 100, then we’re only using about a power of 20. In most Budo, one powers up to a power of 120 or 130 in response to a power of 100. That is not the case here. There are times when we may momentarily go to a 120 or 130, but that feeling is not transmitted to the opponent. Additionally, the three elements that I discussed earlier quickly and momentarily ramp up the voltage. If one does it slowly then the opponent will escape. For that reason, if the person coming to attack wanders in slowly then technique is more difficult to apply. For people who float in to grab I tell them to come get me as if I am going to harm their parents! Then, when they come to grab vigorously, I apply it in that moment. For example, when Sokaku Takeda showed technique it seems that he purposely enraged the opponent. Since if people had heard of Sokaku’s strength they would likely be timid and wouldn’t really come to attack. If that happened it would be difficult to apply technique to them, so I have heard that he would say something strange to them then. When he did that the opponent would become agitated and attack with vigor, so that things would be really effective. That is because the stronger the opponent and the harder they come the more one can use their strength and the easier it is to apply technique. For that reason, our motto is “Don’t repel those who come, don’t follow those who retreat”. When the opponent comes to attack then you do it. Technique can’t be applied to someone trying to run away, and it’s not necessary to apply technique in that situation. Especially because in our case our practice is completely for self-defense. One only uses it for the first time when living a normal life and some trouble occurs. It is with this intent that we are practicing. Q: So there is no first attack from this side? Okamoto: Almost none. We don’t take stances because someone is going to come and attack. If one takes a stance from the beginning then the opponent will be cautious and will not come to attack. So in our case we all take a natural stance and apply technique at the moment that the opponent comes. We don’t stretch out our hands and go to meet the opponent. In kenjutsu, such as Yagyu Shinkage-ryu, there is something called mugamae (“no stance” / 無構え), that just puts one in a neutral position. That is the feeling. Entering from there is a secret teaching (“gokui” / 極意). It is the same as Iai. In Iai when the opponent cuts one draws their sword instantly and cuts. If that isn’t so then it isn’t Iai. It is for that reason that there are things held in common with the principles of Iai. Also in Iai one is not touching the sword, but at the instant that the opponent thinks that they can cut one draws so that there is no way to move the body out of the way. Q: However, if one just thinks about it simply it seems that the one who draws first will be the fastest? Okamoto: That is really a matter of distancing (“maai” / 間合い). If one is daydreaming then of course they will be struck first. One applies technique just before they are struck. That is why it is extremely fast. I said this during training as well, if your opponent comes to attack at a speed of 50 km then in the space of that short distance we must oppose them with a speed of 80 km. If we both move at 50 km then since the other person also has inertia we will be pushed back. This is a training method in which defense and attack can be practiced simultaneously. One hand forms a fist lightly. The other hand moves to grab the wrist of the closed hand, but at the moment that it is touched the closed fist stretches open quickly and fills the grabbing hand. Further, the index finger of the grabbing hand remains straight and one grabs with the other four fingers. This is done quickly enough to make a sound when the hands touch each other (see figures 1-5). Q: What do you mean by momentarily moving with a speed of 80 km? Okamoto: That’s training, training. Conditioning for explosive power. If that is not so then one will be defeated. Sokaku Takeda was said to be a master with the short sword, and that was because of his speed. He’d strike quickly at the forearm, and though your eyes only saw a single strike, when one examined the forearm there would be two black marks there. But even in that kind of contest although Sokaku Takeda would not wear armor, he would have his opponent put on protection. The one not wearing armor would have that much more freedom of movement, and the psychological state when facing a person not wearing armor is different. If you struck them perhaps you could give them a head injury, it tends to cause a kind of hesitation. Q: Even so, developing a speed of 80 km to resist an opponent moving at 50 km must be really difficult, isn’t it? Okamoto: And so, I always say this. Everyone should train on their own and practice grabbing their wrists (in solo training). The accumulation of that training is important, but also important is the timing of entering at the moment one is touched by the opponent. Survey says – this is Aiki! Thanks Michal! Interesting thought about Kikugoro, I’m not sure.